Productivity is the measurement of the amount of work that is accomplished during a specific period of time. Productivity is an important aspect of any workplace and is also directly related to the success or growth of the company or organisation. 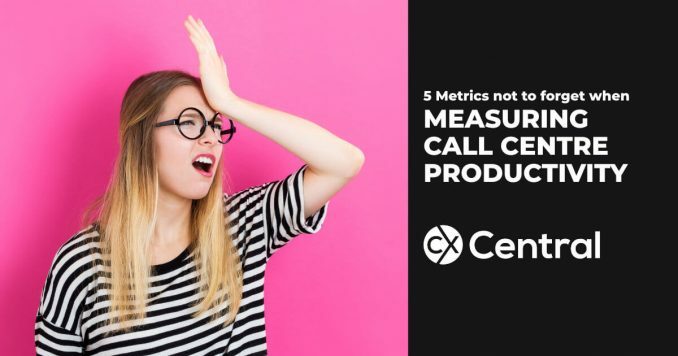 In a call centre environment, a typical call centre productivity measurement would be the calculation of the number of customers serviced over a specific time frame. But this cannot be used as data to form an accurate report for the organisation. A lot of other things need to be taken into consideration, and some of them have been listed below. A lot of companies take into consideration the hold time as a part of the call duration but that’s a wrong thing to do. Hold time can range anywhere from a minute to two despite the fluctuations. Taking into consideration the hold time with the help of a call centre software will help in determining how the calls are actually faring. Call quality consists of elements like the opening of the call, how the agents end it, how they respond to the customers, the tone of their conversation, and asking if they need any further assistance before they successfully end the call. These are also some essential elements that matter while measuring the productivity of the agents, even though they may differ from agent to agent. A variety of call centre solutions (like Aspect) can be of great help when evaluating the call quality of the agents especially when the call centre is huge. Resolution time is the amount of time taken for an agent to solve a query that comes from the customer. Typically a low-resolution time means that agents are serving their purpose efficiently and solving the customers’ problems and queries within time. A call centre software integrated for the organisation’s requirements will help evaluate the resolution time quite effectively. This refers to the time when calls need to be transferred to a senior agent or to someone with a superior authority because the agent was unable to solve the query or provide a desired resolution. If this is repeatedly seen happening, it needs to be taken into consideration even though it directly doesn’t have a correlation with productivity because it indicates that the agent either does not have the required experience or he/she needs more training. Tools like Knowledge Management Systems can help with reducing escalations as they empower agents to gather more information, fast. Abandonment rate is nothing but the percentage of calls that are disconnected by the customer even before an agent answers. Although it is a safe practice to exclude the calls that were abandoned within the first 5 seconds (normally indicating the customer incorrectly dialled your business), the ones that exceed this time are always considered. A low abandon rate depending on the average industry rate (typically under 5%) means that the agents are handling the call volumes quite efficiently. A high abandon rate is on the other hand, is not good for the organisation because it indicates dissatisfied customers and missed customer service or sales opportunities. According to McKinsey, investing in the right tools will enable the organisation to improve skills of customer care. Thus, using online tools or call centre solution software will positively impact the organisation’s productivity and also make it easier for managers to monitor the progress of their organisation.